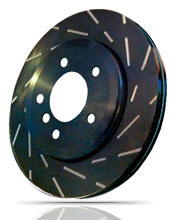 EBC Brakes™ premium replacement brake discs are machined and finished in the UK. These EBC Brakes™ USR series slotted replacement brake discs are black Nitrotherm coated and have narrower multi slots that can help to dispel dirt, dust and water while also drawing cool air under the brake pad and disc contact area, helping to cool the pad contact temperature which can reach well over 1000 degrees. The EBC Brakes™ USR series slotted replacement brake discs improve braking by running cooler and ensuring flat and parallel pad wear. All EBC Brakes™ replacement brake discs, whether plain or grooved/slotted, are thoroughly checked for runout. These discs are suitable for use with all EBC Brakes™ replacement brake pads but we particularly recommend use with EBC Brakes™ Redstuff ceramic super street brake pads for faster street use or EBC Brakes™ Yellowstuff fast street, trackday and drift pads for optimum performance.